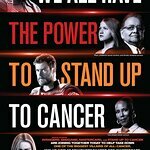 Last week stars from television, music and film came together for Stand Up To Cancer in the UK – a unique new fundraising campaign on Channel 4. 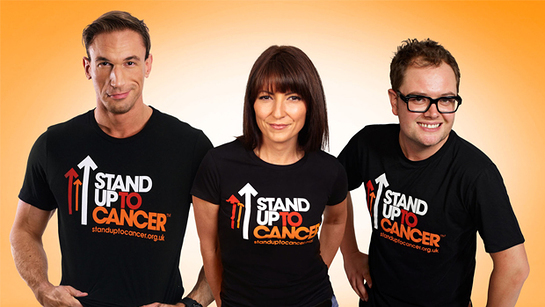 Joining forces with Cancer Research UK, C4’s Friday’s live fundraising event hosted by Davina McCall, Alan Carr and Dr Christian raised an amazing £6,483,995; @Standup2C gained 10,000 followers over the night and was liked on the Facebook page by over 300,000 people, while trending all night maintaining a top five position. Joining the hosts for Stand Up To Cancer live were: Samuel L. Jackson, Bradley Cooper, Leona Lewis, Cheryl Cole, Keith Lemon, Heidi Klum, Jeremy Piven, Heston Blumenthal, Hugh Fearnley-Whittingstall, Alesha Dixon, Ashley Walters, Russell Tovey, Bear Grylls, Jack Whitehall, Tom Felton, Warwick Davis, Jimmy Carr, Derren Brown, Martin Freeman, Dawn Porter, Micky Flanagan, Stephen Graham, Max Beesley and Jonathan Ross. During the show a number of performance ‘battles’ between two dance troupes revealed the amount of money raised so far. They performed in front of specially 4D mapped projections which ended with the £ numbers smashing through. 100% of your donation goes to the SU2C campaign administered by Cancer Research UK. For up to date information please go to [www.standuptocancer.org.uk or www.channel4.com/su2c.